This is the third step of three part outlined process to configuring settings for the transparent effect. The first two steps were listed in the configuration and set-up for uTorrent: "How to Configure Settings for Transparent Effect." Disabling the pop-up move window removes the required user acknowledgement to allow for auto-move. Continued from Step 2 of the guide, "How to Configure the Download Parser Tab Settings." 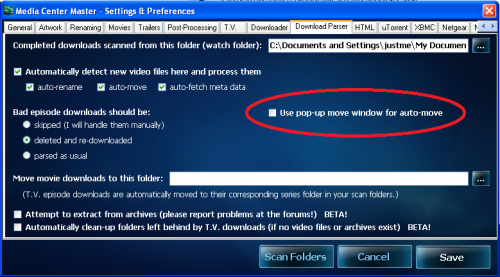 Tick the check box for "Use pop-up move window for auto-move" to remove the check mark.